It took the Navy just five tries to get it right the first time — at least, when it comes to San Antonio-class amphibious transport dock ships. Naval Surface Force Atlantic announced Monday that the New York successfully completed its post-commissioning Final Contract Trials Feb. 4. 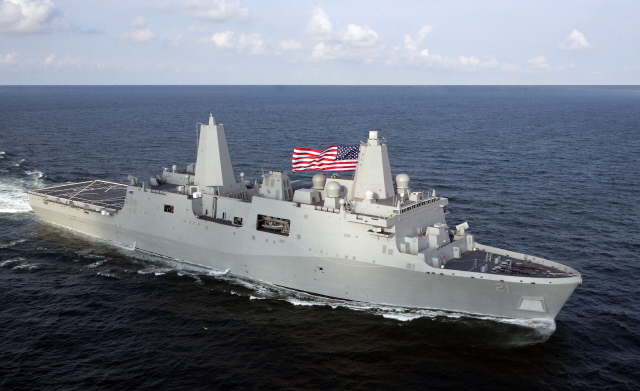 CORRECTION: SURFLANT incorrectly first reported that the New York is the first of the five ships of the LPD-17 class to be certified for sustained combat operations on its first such evaluation. Rather, SURFLANT says, the ship produced the highest score during the FTC process of all previous San Antonio-class ships. The class has been plagued with problems ever since its first, the San Antonio, was commissioned in January 2006. Five years and one long-delayed yet mechanically challenged deployment later, the San Antonio remains moored at Norfolk Naval Station, undergoing main propulsion diesel engine repairs and other work, according to Naval Sea Systems Command; the problems are such that the ship was bumped out of the rotation for a scheduled summer 2011 deployment. The first four ships of the class struggled with lube oil contamination and in late 2009 — just after commissioning — a bent crankshaft was found on one of the New York’s four diesel engines. For the New York, those problems are apparently in the past, with the ship’s major systems having passed muster — after the delay for crankshaft repairs — with the infamously tough Board of Inspection and Survey. FTC inspections begin with two days of in-port checks followed by two days of underway checks including a full-power engine run, steering checks and a ship self-defense exercise. The ship having “scored the highest” of all other LPD-17 ships on the FCT doesn’t come as much of a surprise, given the class’s history. Still, officials were pleased. Wonderful! I am glad. Now lets see how she does coming out of PSA, when they tear her all apart again. *Sigh. How can the two assessements be so divergent? The real measure of LPD class improvement will come later this year when USS SAN DIEGO LPD-22 gets underway for her builders trial inspections. There will be absolutely no excuse whatsoever for LPD-22 having anything but some minor inspection problems. Time will tell is Navy is getting better.